If you’re storing or transporting sensitive electronic parts, you need to ensure their protection from ESD and other dangers. Quantum Storage Systems Conductive Bins, Totes & Accessories offer a durable, top-quality, low-cost solutions. And, with our limited-time offer, you can get FREE Shipping on eligible Quantum products. These Quantum conductive bins & totes protect electronic components from typical electromagnetic interference (EMI), electrostatic, or induced fields. Constructed of carbon-filled, copolymer polypropylene, they have a surface resistivity of <105 Ohms, and are unaffected by washing with normal cleaners. For a closer look at Quantum’s conductive products, view our Flickr photo set and/or our two videos focusing on the Dividable Grid Totes & Containers and the Stack & Hang and Shelf Bins. 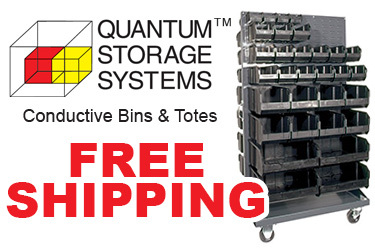 Please visit our "Free Shipping on Quantum Storage Systems Conductive Bins & Dividable Totes" page to shop and save today. You may also contact us by phone (800-966-6020) or email.